With the year-round availability of American and imported lamb, your microwave lets you enjoy lamb roasts quickly and with minimal fuss. The shorter cooking time, compared to oven roasting, makes it more convenient to cook a lamb roast in the microwave. You can concentrate on your other dishes or prepare a savory lamb roast more frequently. A lamb roast can be just as flavorful and tender when you cook it in a microwave. To get a crispy crust you will need to finish the lamb roast in a conventional or toaster oven. 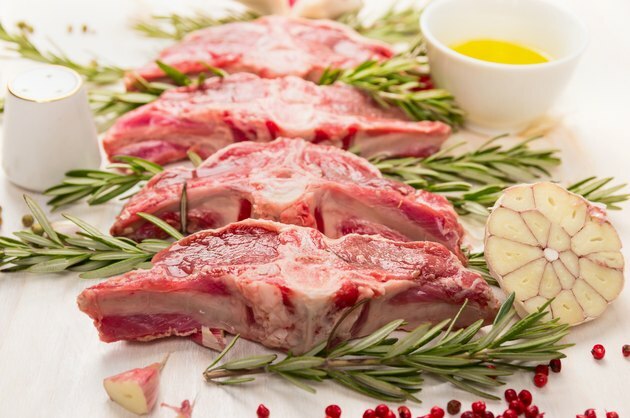 Thaw lamb completely in the refrigerator or in the microwave, before cooking. Consult your owner's manual for defrosting time for a 5 lb. roast. Season the roast with salt, pepper and your favorite spices and herbs, if desired. Put the rack inside the baking dish and place the roast on it. Cover loosely with wax paper to prevent splatters while cooking. Set the microwave power to medium or 50 percent. Microwaving meat on high, even in a low-power oven will result in uneven cooking. Place the baking dish in the oven and set the microwave's timer for 20 minutes, for medium well or 30 minutes for well done. This is half of the total cooking time. Turn the roast over after the initial cooking time expires, cover the lamb with wax paper and set the timer again for the 20 or 30 minutes for the second half of the cooking time. Insert a meat thermometer into the thickest part of the roast when your selected cooking time ends. The correct temperature for a roast is 150 degrees and for medium, the temperature is 160. Add five minutes on medium or 50 percent power if your roast has not reached the correct internal temperature for the doneness you prefer. Let the roast rest in the baking pan for 10 to 15 minutes before you cut it. Microwaves have widely varied power levels but 700 watts is the standard for recipe cooking times. The manual for your microwave will help you determine its wattage. Adjust cooking times for higher and lower power microwaves decreasing or increasing the recipe time.